Three gangsters are forced by their boss into becoming a trio of pop singers. I'd say that's the best anime I've seen and in the list of them I'm comparing this , also stands "Deathnote". 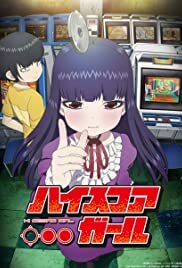 Hi-score Girl is a series that every generation after the Y one (80's +) can relate to and bring back sweet childhood memories. It's really well written and masterfully directed. Won't dissapoint any modern or even "retired" arcade gamer. Looking forward for the even more romantic sequel , considering from the last episode. Won't say more . Give it a try now !